The Australian Taxation Office (ATO) issues numerous Garnishee Notices each year to recover tax debts owed by companies. By far and away the most common type of Garnishee Notice that the ATO issues, is a Garnishee Notice to a company’s bank. These types of Garnishee Notices require the bank that receives them to pay funds held by a company to the ATO in lieu of the company’s tax debt. A Garnishee Notice issued to a company’s bank can have a crippling effect on the company’s business. So how do these types of Garnishee Notices work and what can you do if one is received? 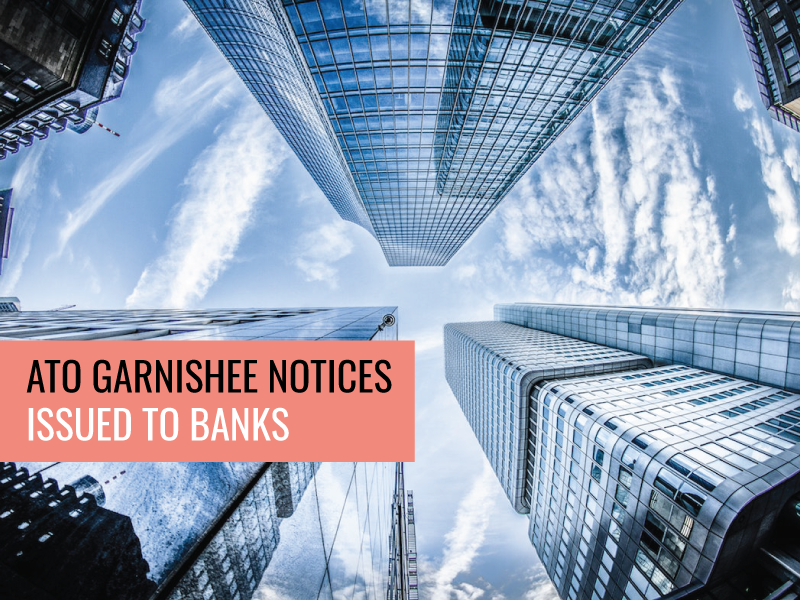 There are two typical types of Garnishee Notices that can be issued to a company’s bank; a once-off notice, or an ongoing notice. a percentage of the balance in the account, which could be up to 100%. An ongoing Garnishee Notice requires a bank to pay to the ATO a percentage of any money held on behalf of a taxpayer at the time of the notice (up to a maximum, which is usually the full amount of the tax debt). It also requires the bank to pay all future money that it receives up to the maximum amount. An ongoing Garnishee Notice may nominate a period to which it applies and after this time, the notice will no longer have effect. What should you do if a Garnishee Notice is issued to your bank? The ATO should send you a copy of a Garnishee Notice that it has sent to your bank or your accountant. Once you have received the Garnishee Notice, it is likely that your bank would have already acted on it or will be in the process of acting on it. You should therefore act as quickly as possible once you receive a copy of a Garnishee Notice. If the ATO has issued an ongoing Garnishee Notice to your main bank, then you may consider setting up a new account with a new bank. You would then close all bank accounts held with the bank that has received the Garnishee Notice and ask your customers to direct all future payments to the new account. This may allow you some time to deal with your tax problems, but at some stage the ATO will take further action, which may include issuing a Garnishee Notice to your new bank. If you can negotiate a payment arrangement with the ATO, then it will not take any further action to recover the debt, so long as you comply with the payment arrangement. But non-compliance could include the ATO issuing further Garnishee Notices. We have written further about payment arrangements here. If a payment arrangement is entered into, the ATO may also agree to remove any ongoing Garnishee Notices, which are still in place. When the ATO issues a Garnishee Notice for a company’s tax debt the company may already be insolvent, or the notice may have a crippling effect on the company’s business. In these circumstances a company’s directors may decide to, or be forced to, appoint a liquidator or voluntary administrator to the company. The first thing you should do however if you get a Garnishee Notice is obtain professional advice from a qualified advisor. So if you have received a Garnishee Notice, you need to act as quickly as possible and if you require assistance, please don’t hesitate to get in contact with us for a no-obligation meeting.